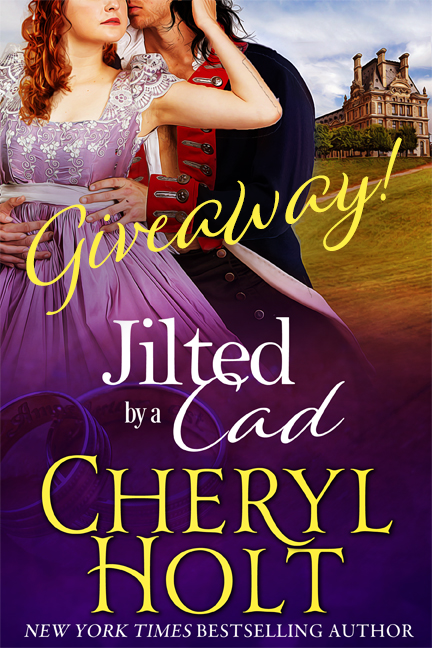 Cheryl is celebrating the release of her new JILTED series by running this contest. She will give away ten autographed print copies of Book #1, JILTED BY A CAD, to ten lucky winners. Since the first three novels in the series will be released together on September 20th, she will also give away one grand prize to one lucky winner of autographed print copies of Books 1, 2, and 3. The three books included in the grand prize drawing are: JILTED BY A CAD, JILTED BY A SCOUNDREL, and JILTED BY A ROGUE. So there will be eleven winners in all. The contest begins on August 1, 2018, and entries will close on September 19, 2018 at midnight. The drawing will be held the next day, September 20, 2018, and winners will be notified by email. You may enter as many times as you wish, but please be aware that Cheryl’s books contain adult content. You must be 18 years of age or older to enter. All entrants’ emails will be added to Cheryl’s general mailing list. The email addresses are used to provide readers with information about Cheryl’s career and her upcoming novels, and the list is never shared with anyone. Please enter by using the form below.